Continuing financial market turmoil and downbeat economic news hit national consumer sentiment hard in the fourth quarter of 2008, pushing down the index of consumer confidence to its lowest level since the fourth quarter of 1990. Sentiment about the outlook for job growth plummeted in all regions, particularly Ontario and British Columbia. 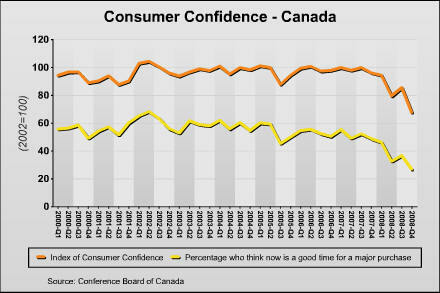 This was the single biggest contributor to the drop in consumer confidence in the fourth quarter. Sentiment about layoffs over the next six months surged in the fourth quarter of 2008, posting the largest quarter-over-quarter increase on record. It resulted in the most negative balance of opinion on employment since the fourth quarter of 1990. The balance of sentiment about major purchases also softened further in the fourth quarter of 2008, posting its most negative result since the third quarter of 1982. A negative balance of opinion means more households said it was a bad time to buy a big-ticket item, such as a home or car, than said it was a good time to do so. This indicator is an important factor underlying the housing market. Increasingly cautious homebuyer sentiment and a less active housing market suggest that home prices will remain under downward pressure. Households’ balance of sentiment about their budgetary outlook also weakened compared to the third quarter, but remained slightly positive. This means more households expect their budget to improve over the next six months compared to those that expect it to worsen.